Fintech, Insurtech, Analytics hottest startup sector? Interesting analysis of where investor's dollars are being spent. It is often innovative companies like360Globalnet that build a "marketplaces" platform for a specific industry ( insurance). Adding data prep and analytics allows insurance companies to access all the data, not just structured, to give staff the information to manage processes better (insurance claims through to repair and replacement). Better & faster service, reduced costs and fraud, more efficient and effective staff. Analytics remains an important category for both markets. 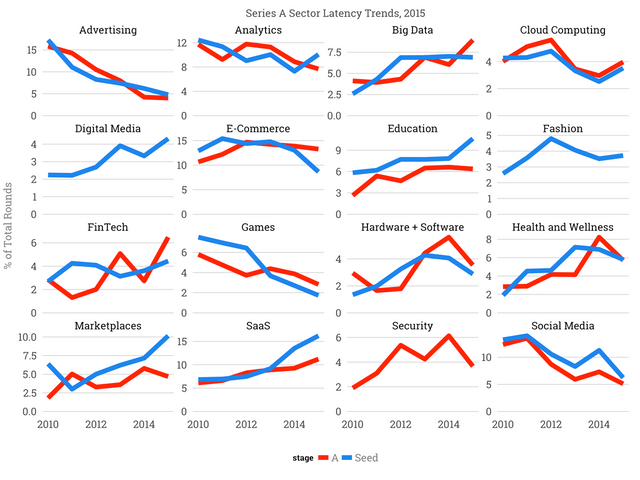 Startups building analytics products command roughly 10% of both seed and series A dollars. Big Data, a term popularized in 2012 that has reached its apogee in 2015 according to Google trends increased from 2.5% of the market in 2010 to more than 7.5% of the series A market in 2015. Seed investors’ interest in Big Data has remained constant over the last four years while series A investors’ appetite continues to grow.